Yes...two posts in one day...yikes. Hello, Wednesday was a busy day for me though I couldn't pinpoint my biggest time grabber if I tried. By the time I got around to working on my Homework, it was about 2 am...I had decided to put it off until Thursday, but then I got what I thought was a second wind...nope...it was just a case of the slap-happies. You know that time when everything is funny and you are as brilliant as can be? I made two mini cards following the lessons. I admit to closely copying the lesson cards. Card One has color gradations using 3 ink pads, this took two attempts for the colors to work as they should according to our lesson. We also received a tip on making paper bows...TIP---at 2 am fingers don't work to well on small objects. 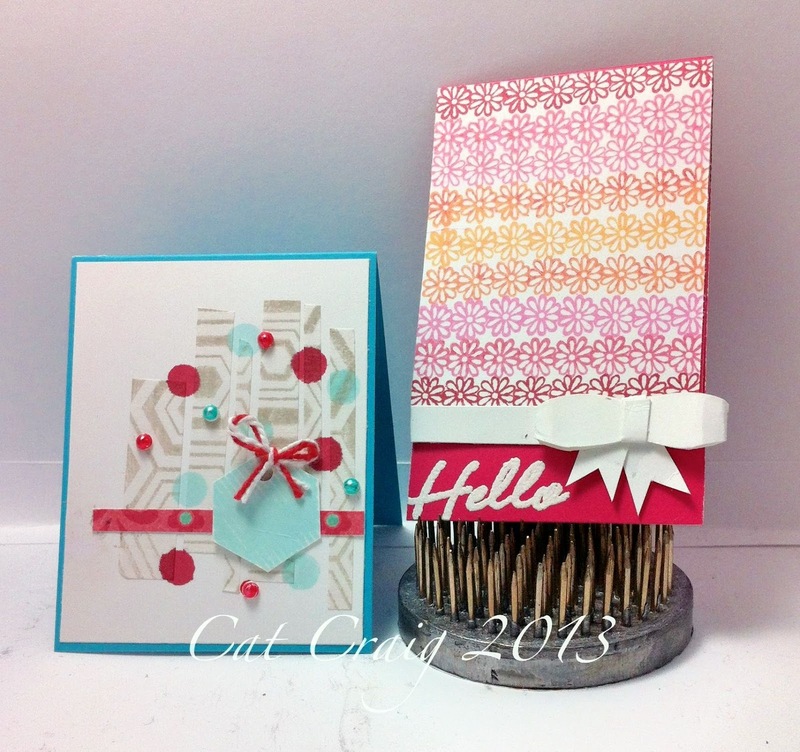 Card two was born around 2:45 am...I loved the idea of using blank address labels for part of the pattern. Where I got inventive...(again 2 am brilliance...lol) was the coloring of white pearls with my pointy tipped sharpies and the round color dots...made with round foam adhesive dots...the super tiny ones stuck to the end of a pencil. Hopefully you have had a laugh today. Hi, a quick post. 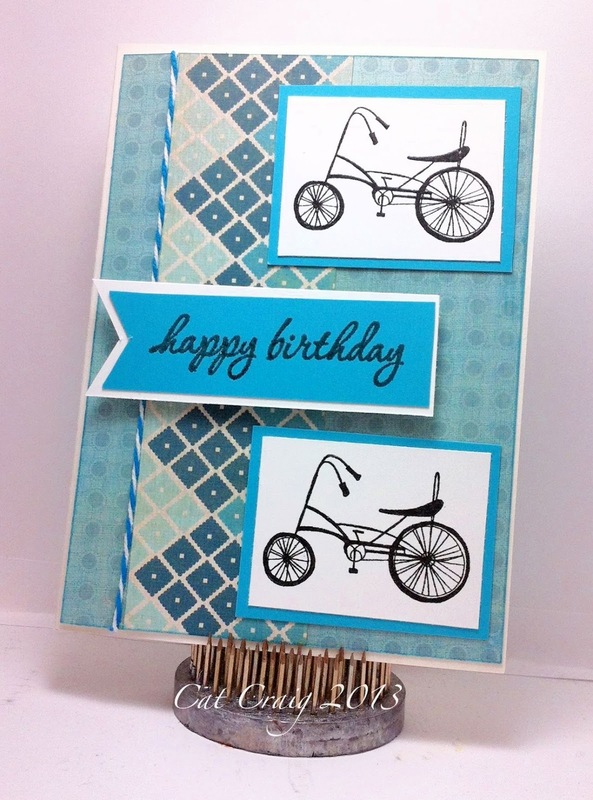 Here is a very fast birthday card that went in the mail today for a birthday tomorrow. Luckily the recipient is local. This too has been on my crafting must do list since January 4th! It was made entirely from scraps so I don't have all the item details. I deliberately only matted the center panel. I think it is an interesting look. 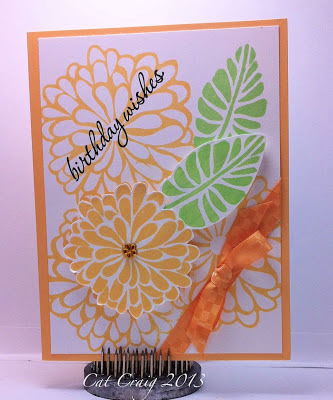 Back again with my homework assignment from Online Card Classes' Clean and Simple Card Making Two. Today's lesson and homework assignment was One Layer Cards. We were treated to several video's, these ladies are talented, smart, and so sure about what they do. I am in awe. I looked through my limited stamp supply, and found a set to use. 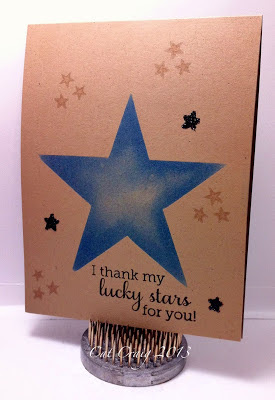 Since my card involves masking, I wanted a big star shape. I had none, so I ended up drawing one freehand with a ruler and pencil, then cutting it with a craft knife from the masking sheet. I think it turned out fairly well. The mask was placed on the Kraft, then ink was sponged on deliberately leaving the middle portions lighter to give an illusion of dimension. I added versamark stamped star clusters (which I cut off the sentiment and rearranged); colored them with a similar Kraft-y shade of marker to make them stand out just a bit more. My final bit of embellishment is some black glittered stars. They were stamped with versamark, then I filled them in with my quickie glue pen dumped some glitter on them and left them to sit while I made hubs dinner. A good thing, I probably would have tried to shake the glitter off too soon otherwise. I'll give the card to hubs in the morning. He hunted down my craft order that a delivery service dropped off at the wrong address. I signed up for another online card class, the last one I took was Stretch Your Stamps, I liked the format and the information was valuable. 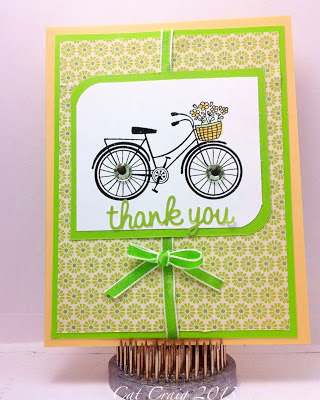 When I saw Clean and Simple Card Making 2 being offered I signed up. The instructors are so talented, and willing to share tips and tricks. It is just fun watching them create. I have no clue about clean and simple cards, so this is a good opportunity for me to learn. Homework for Day #1 was to pick one of 4 sketches and make a card. The lesson was entitled The Craftsmanship of Clean and Simple Cards. There was a wealth of information there for me. I thoroughly enjoyed the class. Day 1 was worth the price of admission for me. I spent at least an hour on this card, which surprised me. Of course a lot of that was trying to get the misting to work. The class lesson for the card I chose to make used misting and a mask, I have no masks and only 1 mist here on the east coast. So I went for an emboss resist to try to mimic the look. I over misted several times, then finally just went with it. 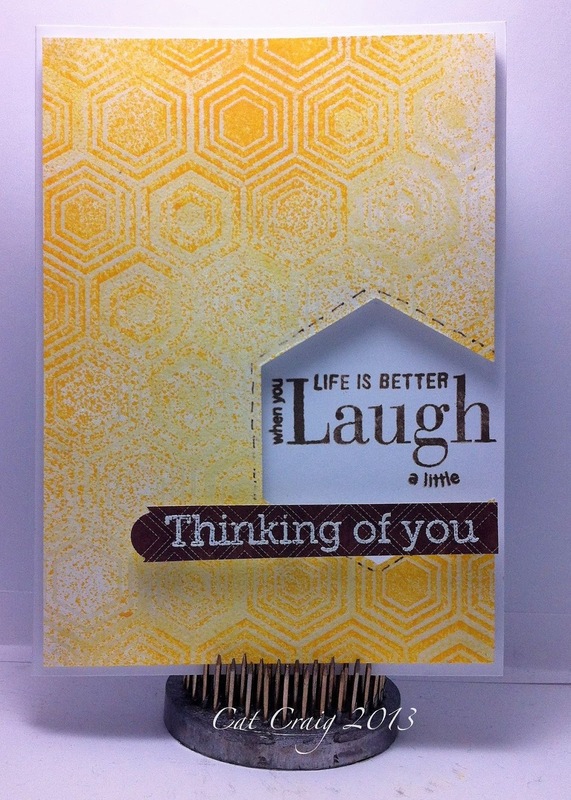 I like the mist pattern in the center diagonal of the card I think it highlights the sentiments. Two weeks minus 1 day of homework projects coming up. Thanks for stopping by. So I got myself together Thursday afternoon last week to get one of the cards made for my SIL's birthday today. I was hoping to beat the mail carrier to our mailbox and save a trip to the post office. It snowed Thursday, and while I love it from my window, I am not too sure this So Cal Ex-Pat (as hubs recently described me) wants to drive in it. Call me a wuss, I can take it! 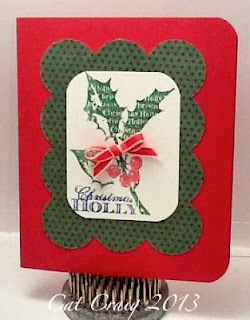 It was a mad rush of stamping, embossing, coloring, and embellishing...TWICE. I smeared when I was almost done the first time, it was not something that could be covered up by popping something up over the smear (yes I have done that!) and I had to make the stamped portion again. Patience is not my strong suit. However, I can say I was victorious. I beat the postman to the box and I love the card, especially that little bit of curved ribbon at the bottom of the paper flower. I also changed up the sentiment placement the second time around. Do you ever have a mad rush card to make? I played along with another challenge over at Shopping Our Stash; Challenge #86, use your oldest ribbon. I am currently on the East Coast, and I have had these snippets of 3 ribbons since I set up crafting space here. Every time I tried to use them they just didn't look right. That might still be the case, but they are now out of my stash. I decided to weave the ribbons together after cutting them down further to give me about 8 pieces . I got some packing tape, laid two pieces together slightly overlapping and then laid the wider tape piece sticky side up on my work surface. (This method came to me after several attempts on my apparently slippery work surface and unladylike outbursts) The weaving went much more quickly using this method. 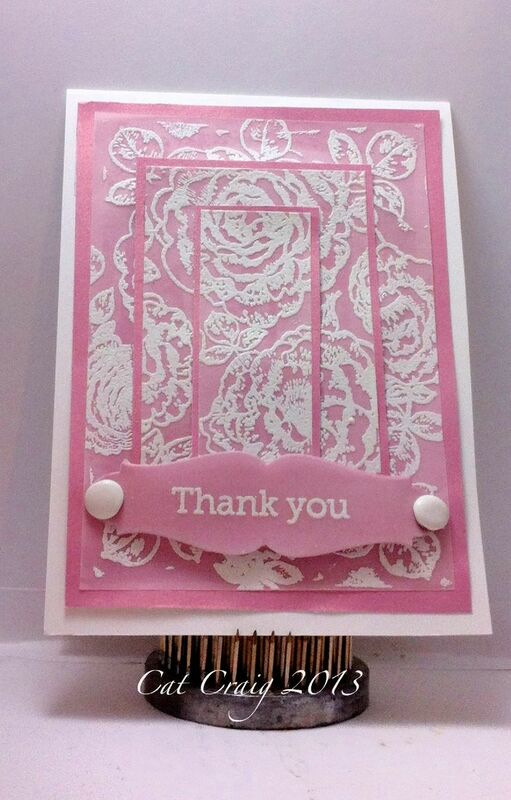 Two spellbinder dies were used to cut the frame, a scalloped edge and a smooth smaller edged oval. Patterned paper was attached to a light card-base which I edged with a black sharpie. The frame was placed on the woven mat. Once it was secured, I trimmed the woven piece to fit under the frame. The sentiment was stamped and embossed with white powder, buttons were threaded up and attached with glue dots. While I do love bright colors, I have an equal love for the combination of black and white. I struggle with cards for the male gender. 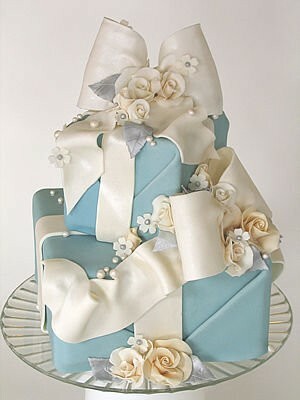 I love bright colors, ribbons, frilly stuff and flowers. SO NOT Male stuff. I found this bicycle stamp, which clearly is a boys bike. I have a some younger nephews, so this card will probably go to one of them for his birthday this year. I did manage to sneak in a bit of twine...but its not girly...its BLUE. What do you do to make a male themed card? Or a pre-teen boys card? 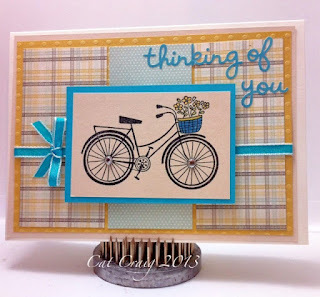 Another card made with that cute bicycle stamp I rediscovered last week. Many of the same types of elements, but a different layout. I love the bright colors. Today I took out one of my first ever Hero Arts stamps. It's called Sweet Threads by Hero Arts. 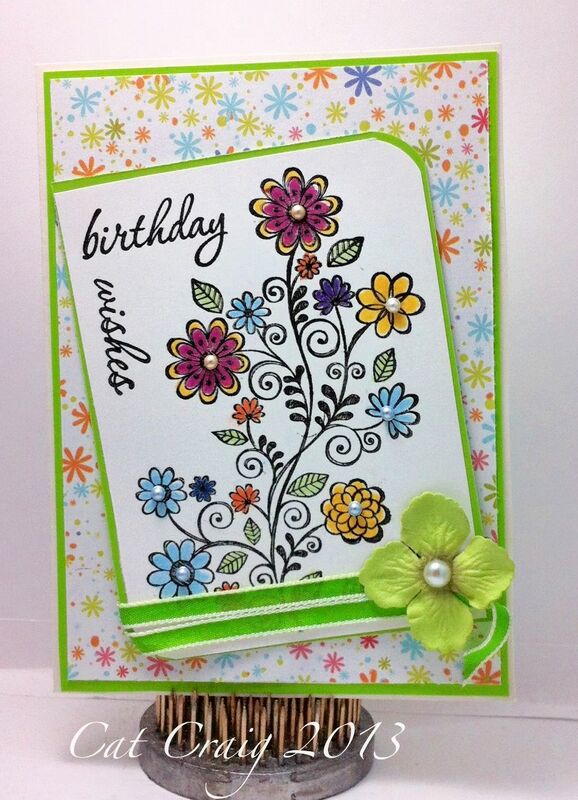 I love flowers and this stamp set has several flower stamps along with a leaf stamp. I made two very different cards with the stamp set. The first card features a stamped strip double matted. The second card features cut out and popped up images. Thanks for stopping, have a great week. A good friend of mine is changing jobs. We worked together for the same employer and met one another almost 20 years ago. A wonderful friendship developed. 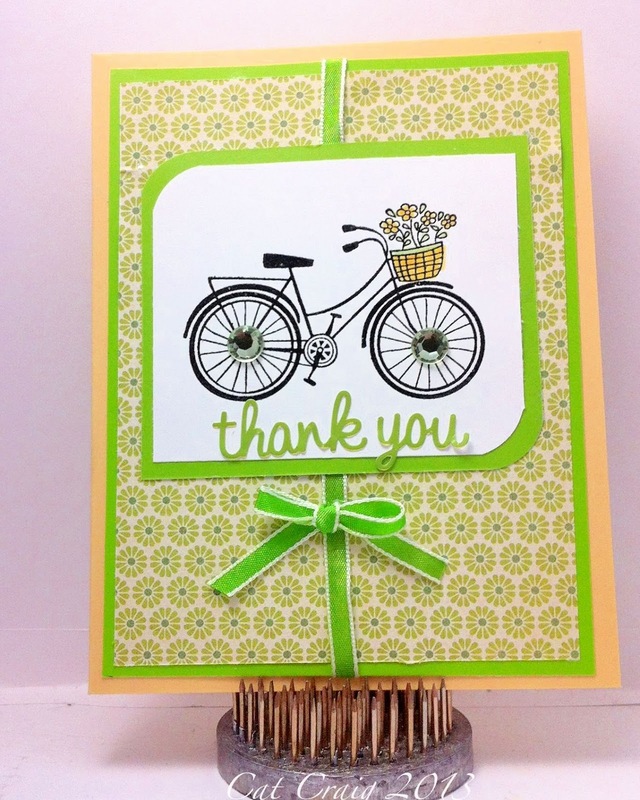 I am sending her this card to wish her well in her new work-life adventure. I have a bit of a thing for three panel cards, so I again went to that design. I too loved the embossed vellum butterfly I made a few days ago. Glitter though was not quite right for this card. 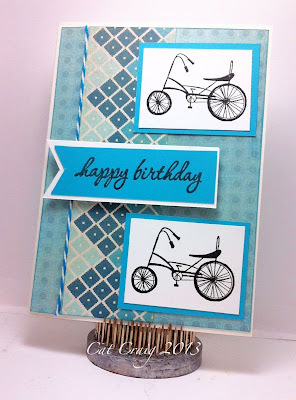 I picked out two patterned papers I liked, a light and a dark background. Three panels were cut, plus one strip for the sentiment. 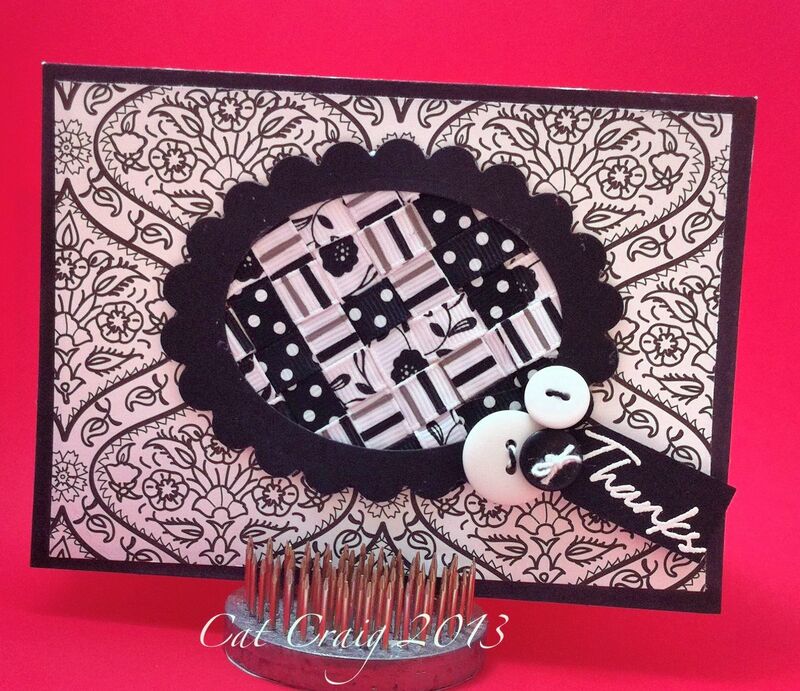 I placed them on white card with inked edges to match a common color in the patterned papers. I stamped the butterfly twice, once on vellum for heat embossing and once on the dark patterned paper. I cut the butterfly out from both pieces and layered them. I like the subtle coloration the patterned paper gives to the vellum. A ribbon was added to anchor the top of the sentiment strip, letter/number stickers were added. All was then mounted on to the card base. I'm still in my vellum mood. I received my exchange card yesterday from my friend in California. 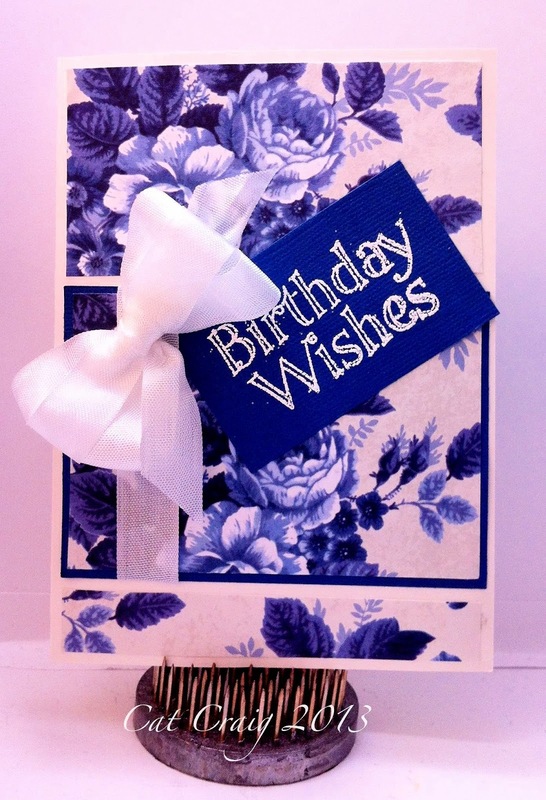 She sent me a lovely layered card using patterned papers. I am sure there is another name for these cards, but it escapes me. I decided to try something similar but using a stamp and embossing it. The time consuming thing about this is all the dimensions involved. I started out with the card base, and subtracted partial inches from that until I had the 6 nested layer dimensions. Then I made my cuts. The vellum layers were temporarily attached to one another, then stamped and heat embossed. 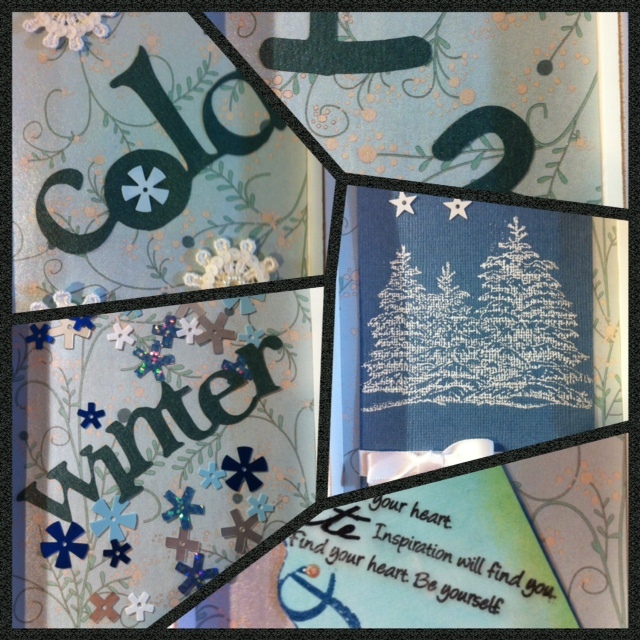 While it cooled, I put together my sentiment strip, die cutting, stamping and heat embossing. I do not buy colored embellishments anymore. I dye them or in this case, I used a silver brad, got it nice and warm with the heat tool, then dipped it into my white embossing powder. I also put the heat tool to it to smooth it out. 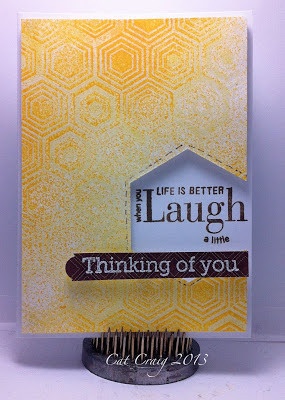 Lastly, all the layers were put together, the sentiment strip attached then the whole stack added to the card base. I need to get together some have-on-hand birthday cards, that could be given to a male or female. To start my collection I used a new embossing folder, Clouds. I inked up the side with the indentations for the embossing. 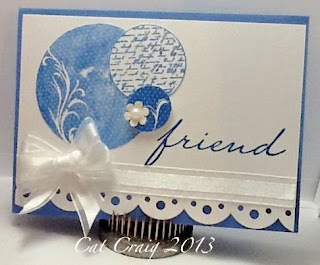 Turning my white cardstock into a blue sky with pop-out clouds. 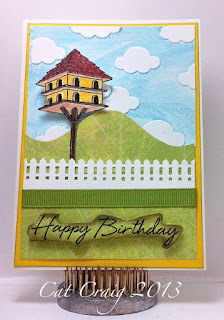 The birdhouse was stamped, and heat embossed in black, then colored with the markers. As a final step, I cut out just the birdhouse and its stand. The stamp actually has a frame and foliage around the birdhouse. I used a Martha Stewart punch to create the fence. The hill was made using a Kiwi Lane border template. I can never draw those things free hand. 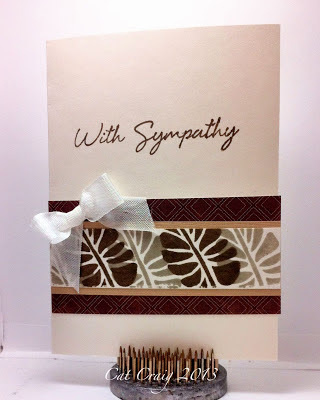 The sentiment was stamped and heat embossed, then cut out, I inked along the edges with walnut stain distress ink. 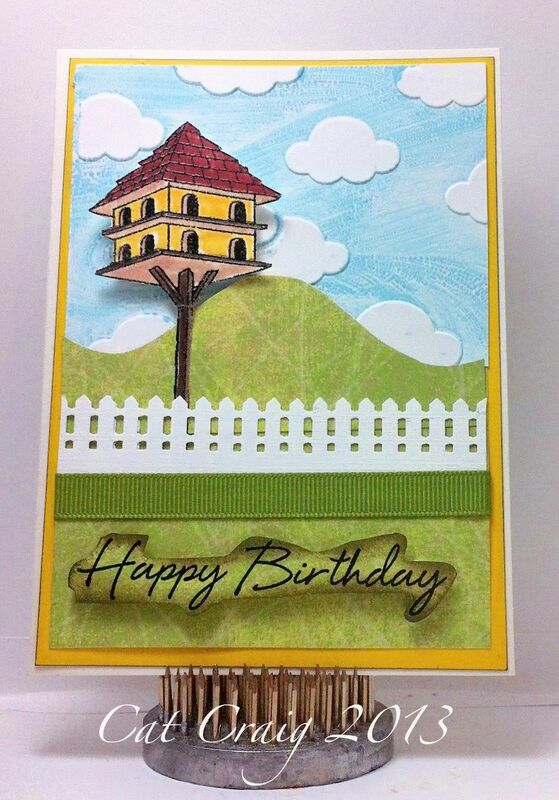 I popped up the birdhouse, and the sentiment when putting all the elements together. 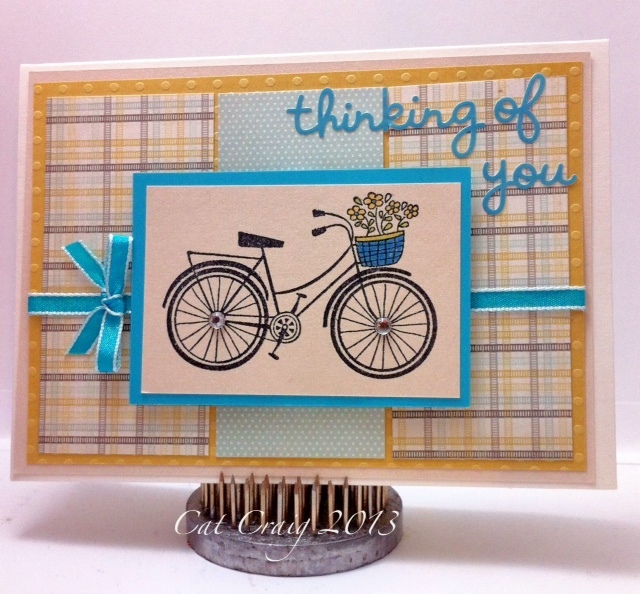 Another 3 paneled background card today. Again starting with the patterned paper, coordinating ink, embossed vellum and some ribbon. Oh and did I mention some gorgeous rose gold glitter...I wish it would photograph better. 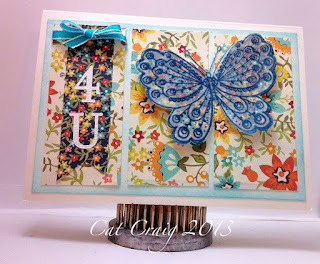 This is without a doubt my favorite Hero Arts butterfly stamp, I just wish it had a coordinating die cut! I am not a fan of fussy cutting, I blame that on my arthritic thumbs, not my impatience. It is so much prettier in person. I have sent it on to my friend whom I exchange cards with each month. This card will definitely be remade for my stash. Oh...and the post title? That is the interior sentiment. Sometimes, the front just needs to be left alone! This bicycle stamp from Hero arts was included in the prize package I won for a scramble at the Hero Arts flickr group last April. I had been wanting to use it, but never had just the right idea. I think my inspiration board is working. There is something about 3 panel cards that I seem to always catch my eye. I love layers as well. This card has both those elements. I flipped through a 6x6 pad first to find some patterned papers I liked. Then tried my best to match those shades with the coloring and other elements. I think it worked out well. My darling MIL included a sweet Christmas stamp in my Christmas gift this year. She has been so supportive of my card-making. I am so blessed to have her in my life. I can without any hesitation say she is the nicest person I have ever met. I know holidays have passed, but I still wanted to put together a quick card to show her how the stamp might be used without having to wait until the end of this year. Hubs thought it would make a nice interior stamp, but he only saw the wood block with the mono-color image on it. He was surprised with the outcome using the multiple colors, and now agrees the stamp has a lot of potential. This is my first time playing in this challenge. It is titled Elegance, and the photo colors, as well as ribbon(bow) and a flower must be used in the creation. Here is the inspiration photo. I am in a blue and white phase right now, so this challenge worked well for my current color obsession. I love the background stamps, and have been looking at the Hero Arts - Studio Calico Houndstooth for a while. I picked it up. 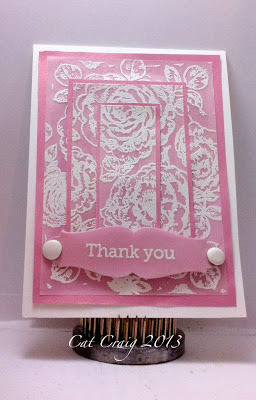 I stamped it on white with distress ink, heat embossed it in clear, then die cut some flower layers. 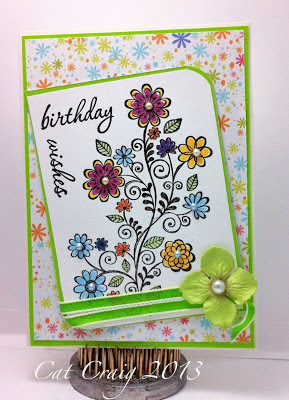 The middle layer I inked up with more of the distress ink to give the flower depth. In my stash of embossing folders that I hauled cross country with me, I found...guess what...you betcha...more houndstooth. 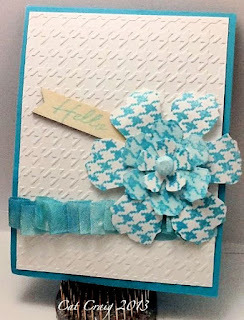 I embossed a panel, put my flower on it, added some died seam binding, and had to stick in a bit of wood veneer(also courtesy of the Archiver's stop). I like LOVE the juxtaposition of the manly houndstooth pattern with the girly flower and ribbon elements. 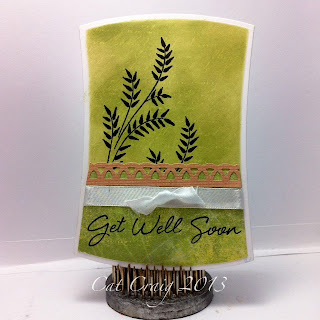 I have but a few Penny Black stamps, but for some reasons I am drawn to this monthly Saturday challenge. 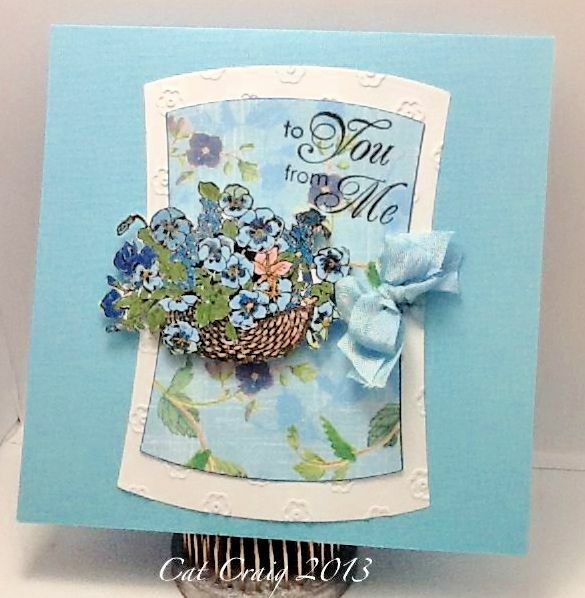 The theme for January is "January Blues" use only Penny Black stamps and highlight the color blue in your creation. Here is my card, it's going to a cousin of my hubs, who is also a card maker. I met and talked cards with her at a family reunion over the holidays. Almost the first week of January gone...51 to go. Yikes. My nephew explained to me over the holidays why the years seem to go by so fast as we get older. At 10 years old, 1 year equals 10% of your life...at 50, one year equals 2% of your life. That is about as good an explanation as I have heard yet. My Dad isn't feeling well, he is down with a cold. So I made him a card to cheer him up. By the time it makes it to the west coast, I am hoping he is on the mend. 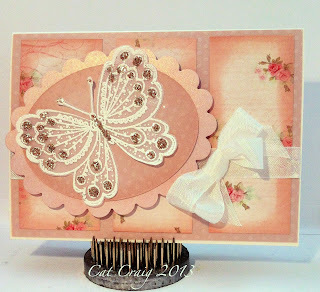 I made a shaped card using Spellbinders Reverse Wonky shape, it is just so much fun. I cut two shapes out, then left one inside the die. I first stamped Old Letter Writing on it in versa mark. I waited for it to dry (but perhaps not quite long enough) Then with the die still in place I added Antique Linen and Peeled Paint ink. Then I cut out a small section from patterned paper much like the inking colors. I traced the inside of the die on the wrong side of the patterned paper, because I wanted that white edge all around the card. Next I punched a border, also cutting the length on the inside border of the die. Next, I stamped the leaves and the sentiment. I added ribbon to the patterned paper bit, adheared it to the card face, then added the edge punched strip. Once the front was complete, I scored the second die cut and adhered it to the back of the front panel completing the card. I picked up a photo tray from 7 Gypsies, and plan to change it out every so often. The tray holds 6 4x6 spaces. I had 1 sheet of patterned paper that I have loved, and have not had the right project in mind for it. When I was flipping through my stash, it jumped out at me. 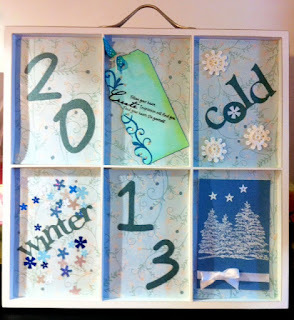 I cut it into 6 4x6 pieces, and added some sort of embellishment to each of the pieces. Then they were placed into the tray.